Description • Provides extra support around the chest and over the shoulders to help prevent leaning and forward sliding. • Provides extra support around the chest and over the shoulders to help prevent leaning and forward sliding. 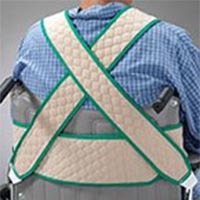 • Reversible design allows positioning of flap release either in front for individuals who can self-release or in the back for caregiver assisted release.